Berkeley City Landmark in 2000 and is eligible for the National Register of Historic Places, Gould said. The West Berkeley Shellmound site may have contained two shellmounds, with the largest near Second and Hearst Streets but the surrounding village site is now believed to be bordered by Hearst Street on the North, University Avenue on the South, I-80 on the West, and Fifth Street on the East, with a satellite shellmound in the eastern portion of the site. 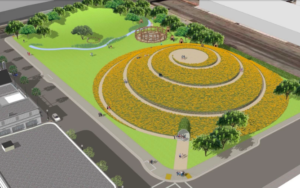 Co-founder of Indian People Organizing for Change (IPOC), Gould presented an alternative vision that would preserve the 1900 Fourth Street site and create a 40-foot mound with a spiral walkway. Following years of contentious debate, developer West Berkeley Investors (WBI), a subsidiary of Danville-based Blake-Griggs Properties, was the first in California to invoke new state law SB35 (Wiener, D-SF) that allows residential builders streamlined approval to bypass local environmental review in exchange for making half the units affordable to households earning less than 80 percent of area median income ($80,400 for a family of four). The 260-unit mixed-use development complex would have some 27,000 square feet of stores and restaurants, a 7,000 square-foot park, community center, and a multi-level parking a garage. The over-the-counter approval process for zoning-compliant projects is aimed to encourage affordable housing. SB35 requires the City to approve the project within 180 days if the planning department qualifies it under SB35. Developers sought Ohlone approval of alternate plans to include fewer housing units, offering the Ohlone one-quarter of the property in exchange for their endorsement, an offer the latter rejected according to the Blake-Griggs website. Gould said the offer wasn’t accepted because it required removal of eight to ten feet of earth from the entire 2.2-acre parcel. Heyday Books founder and author-publisher Malcolm Margolin spoke in support of Shellmound preservation. “It has a story… it’s a story of the history of Berkeley… it’s a story you have to know,” he said. Margolin is author-editor of The Ohlone Way: Indian Life in the San Francisco-Monterey Bay Area, named by the San Francisco Chronicle as one of the hundred most important books of the 20th century by a Western writer. At Heyday Margolin also oversaw publication of quarterly magazines, News from Native California, devoted to the history and ongoing concerns of California Indians, and Bay Nature, devoted to the natural history of the Bay Area.